During a tour of India, Carolyn Handler Miller discovers that she'd accidentally left behind an important purchase. Disappointment is soon transformed to surprise and delight when a feisty stranger steps up to save the day. In the weeks leading up to a trip to India, Carolyn Handler Miller imagined all she'd see and experience: elephants, camels, monumental architecture, gorgeous saris and mysterious rituals at the Ganges. What she didn’t envision, however, was an unexpected aspect of the culture that left her questioning her ideas of privacy. The darkness of the night and the troublesome roads were worrisome, and at first it was a relief to get out of the car, but then the destination itself proved to be a scary proposition. Our ferry in the moonless night looked sinister. And when we thought about the fact that we had entered the terrain of ferocious crocodiles, the scene in front of me seemed straight out of the famous Anaconda movies. The lone lantern lighting the boat and the stillness of the water around us felt menacing. At first, most of us laughed to ward off our fear. And then none of us spoke. Did we fear waking the reptiles? I do not quite know for I had become too numb to think coherently. Do not mistake me; I am not one of those who succumbs to fear very easily. But when it came to the prospect of being eaten by crocodiles, my mind became my own worst enemy. I kept repeating to myself that the creek was full of salt water crocodiles and I kept replaying the visuals of the Anaconda movie. In retrospect, and with objectivity, I can say that the boat ride was actually peaceful and serene. A Partner Post by PerpetualExplorer.com contributor, Anitha Aravind. 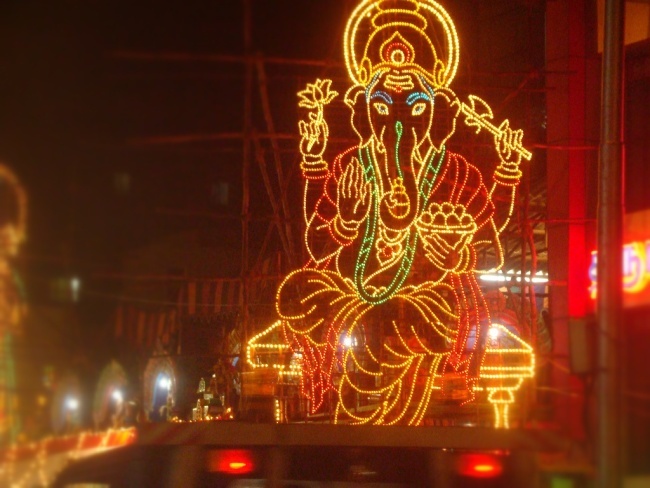 In Chennai, where I live, there may not be a park or shop for every street in the city, but there definitely will be a temple for Lord Ganesha, the elephant-faced God. Under a tree, outside big houses, in apartment complexes or even right in the middle of the road, these temples are small but revered. Most people begin their day or any venture with a visit to their neighborhood Ganesha temple for a glimpse of their lucky mascot. When it’s time to celebrate the birthday of this charming God, usually in the last week of August or the first couple of weeks in September, the entire country bursts into festivities. This festival, called Ganesh Chathurthi or Vinayaka Chathurthi, is a community affair celebrated throughout India, but nowhere is it as grand as it is in Maharashtra, specifically in Mumbai. For thousands of people in Mumbai, this festival is a main source of income. There are plenty of myths associated with Ganesha, but the most interesting one is the story of his birth and how he got his elephant head. It is said that Goddess Parvathi lovingly carved out a boy out of turmeric paste that she had applied on her body. She instructed the boy to stand guard outside while she took a bath. When her husband Lord Shiva came to meet her, this boy refused to let him in. Known for his temper, Shiva ordered his force to attack the boy, but they failed in their attempt. Then Shiva himself attacked and beheaded this boy. In the darkening room, as dusk drew its graying curtains, there was enough light to see the dirt smudged on the aqua walls. The volunteer coordinator, Wongel, sat next to me and translated. We were on rugs thrown over thin mats, with small tables in front of our crossed legs to hold the tea that could not be refused even though we were not thirsty. My “adopted” mother, my Ama-le, seemed mostly concerned that we eat her hard biscuits and drink her sweet milk tea. My hand trembled slightly as I held the teacup and tried to look like someone she would be pleased to have in her home for a month, someone who could do the field work that she needed to have done. Wongel explained that she didn’t expect me to be able to do as much work as they did and that she wanted me to let her know if I had any problems at all. Silently I questioned how this would ever happen, given my half-day Ladakhi language workshop and her apparent lack of English. I realized that my few learned phrases, like “Jule, Kamzang-le” (hello, how are you? ), wouldn’t go very far. I went to Ladakh, a mountainous desert region nestled high in the Indian Himalayas, to live for a month with a family and help them farm, as well as to learn what I could about their traditional Buddhist culture and the forces that shape their relationship to one another and their environment. Our home had one main room, where we cooked, ate, and socialized. That first night, Ama-le squatted in the corner. There were bowls of flour and water on the floor before her, and plates of shelled peas, sliced potatoes and leafy greens. I took my same place on the mats, waiting for some indication from Ama-le as to what I should be doing. She mixed the flour and water, lightly kneading the dough while Nono-le (Ladakhi for young brother) shuffled around the room, his arms held straight out before him like a zombie. Three steps and he was down, crawling. Ama-le delighted in what appeared to be her grandson’s newly acquired skill of walking. Imitating him with a waddle and extended arms, she looked at me and laughed. Love can make you do many things. It can make you laugh. It can make you build the Taj Mahal. The epic tale surrounding the construction of the Taj has all the trappings of a Hollywood fiction – tragedy, romance, betrayal, murder – but this fable is true, and is one of history’s great tragic love stories. The story goes that at the ripe old age of 15, Prince Khurram, who would later become Shah Jahan, fifth Emperor of the Mughal Empire, married 14-year-old Arjumand Banu Begum, and fell desperately in love. He gave his beloved the name Mumtaz Mahal (Jewel of the Palace,) and over the next seventeen years they had fourteen children, six of which survived past childhood. The seventeenth child died during birth, taking her mother with her. The Shah was so devastated by the death of his wife that he locked himself away for eight days with no food or water. Legend has it that during this time the image of the Taj Mahal came to him in his dreams, so he emerged from isolation, organized a board of architects, and within a year construction commenced. We arrived late at night at the field office of the nonprofit, a crumbling cement structure with a few rooms and a few rusted bed frames with torn, flattened pads. I was here to document the progress of a multinational water-supply project in this drought-challenged desert region in India’s western Rajasthan state. No luxury hotel here. Up before sunrise the next morning we first visited water catchment areas, where large areas were dug out a few feet down, the women wielding picks, the red dirt transported away with beat-up metal bowls by all available family members--typically grandparents and grandkids, who often worked together. The elder male stood at a distance, dressed in white--as if a maharajah from the past, leaning against his wooden cane--while the women, dressed in brightly patterned red saris, toiled behind him. It’s the women and girls who are most affected by the water shortage here. Many in the villages spend up to five hours a day walking to and from the closest well or storage tank, carrying water in their beat-up metal pitchers. Water for drinking, cooking, washing--it falls to them to fetch it, however far away it may be. Male/female roles are strictly cast here: Whatever it takes to keep the home and family running, it’s up to the females to get it done. At one point, Michael, my partner, had teasingly picked up one of the full water containers and placed it in my arms, and my legs almost crumpled. I could not imagine how these tiny women could carry these on their heads. The next stop was a completed water catchment and storage area and as we drove up I could see the bright white paint job on the 12-foot round tank, jutting up about 2 feet from the ground, the lower half nestled tidily in the hard clay soil. 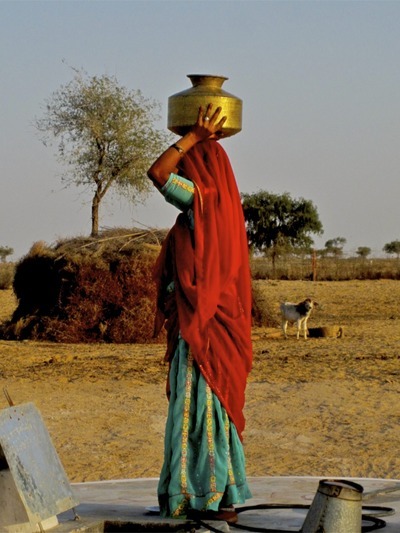 A young woman stood atop it, quite shyly, covering her face with her tattered sheer sari while balancing her metal water jug adeptly atop her head. Her eyes seemed to bore through me, even in their shy state. By now everyone has seen, or at least knows about, the movie Slumdog Millionaire and its astounding sweep of the Oscars, the Golden Globes, and millions of movie-watchers' hearts worldwide. For good reason – the film is affecting without being affected, has great multi-dimensional characters, and gives us phenomenal cinematography with brilliant India as its backdrop. Now available for purchase in TheTrip Shop!This tale of life and love in the slums of Mumbai alternates between heartbreak and triumph. The story follows two brothers who live in an underworld of abject poverty, far removed from the country’s glitzy upper class or technology and business boom. Their lives become even more brutal after they are orphaned. Following them throughout their childhood and into early adulthood – along with their friend Latika – we see them fight against exploiters, brothel owners, child abusers, and even each other, in their struggle to survive. Slumdog Millionaire is a fictional movie ending with a bizarre twist of fate. However, the reality of the story is that for millions of children in India, the life portrayed in the movie is a a world away from the rags-to-riches ending of the film. Today there are 25 million Indian children living without parents, on the streets or in orphanages or other institutional homes – some good, and some bad or corrupt like the one portrayed in the movie. They live in orphanages, slums, railway stations or on the streets, where they are highly vulnerable to abuse, harassment, HIV/AIDS, and being trafficked into child labor if they're lucky - brothels if they're not. Slumdog Millionaire shows us a side of India, and a way of life, that hundreds of thousands of children in Mumbai alone struggle to survive every day.